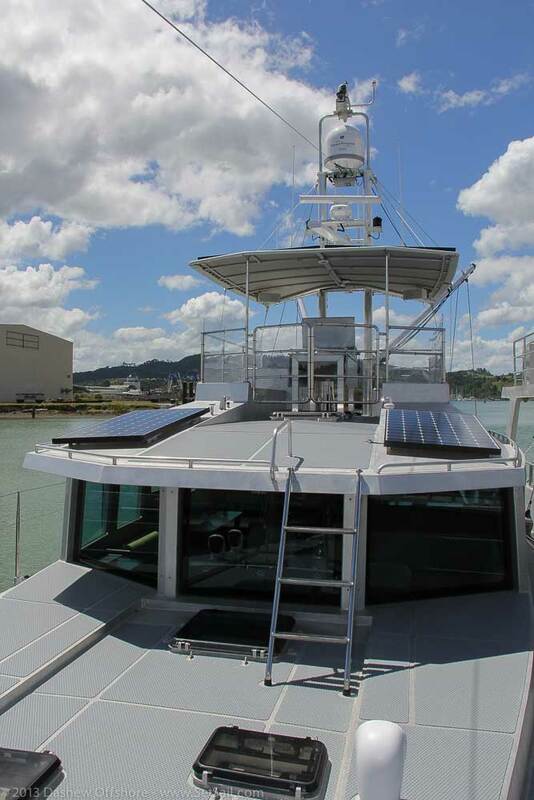 And a year from now we will be showing you photos of the Wicked FPB 97 in its element. We cannot wait to see Ivor Wilkins’ shots from his chopper with the FPB 97 slicing through the waves. The start of the N2K data system aboard FPB 97-1. 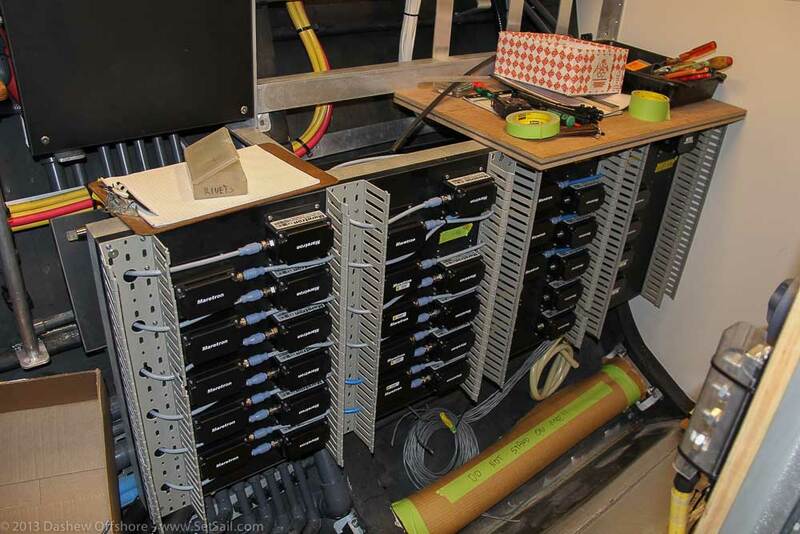 Just a few of the Maretron modules are shown here. The pieces are piling up for FPB 78-1. And FPB 64-8 is now undergoing owner trials. 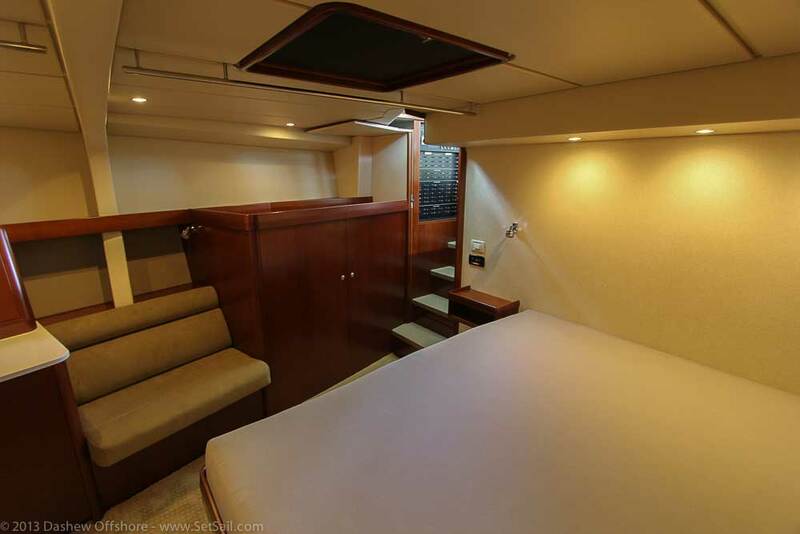 High efficiency solar panels are installed on the flying bridge awning and great room roof. 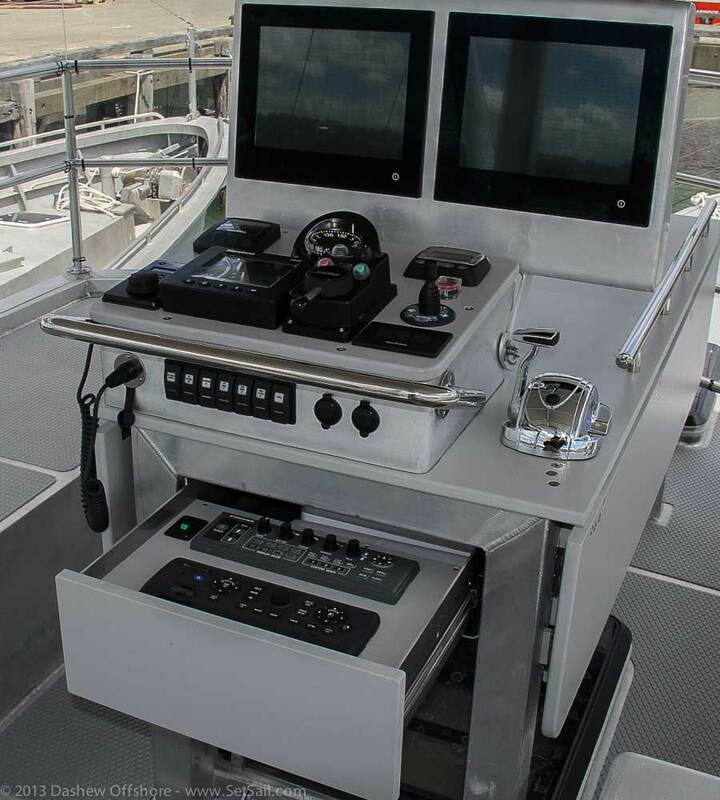 Here is an interesting approach to electronics controls on the FPB 64 flying bridge. And a quick look below. Note the door awning frame support that transitions to a handrail. 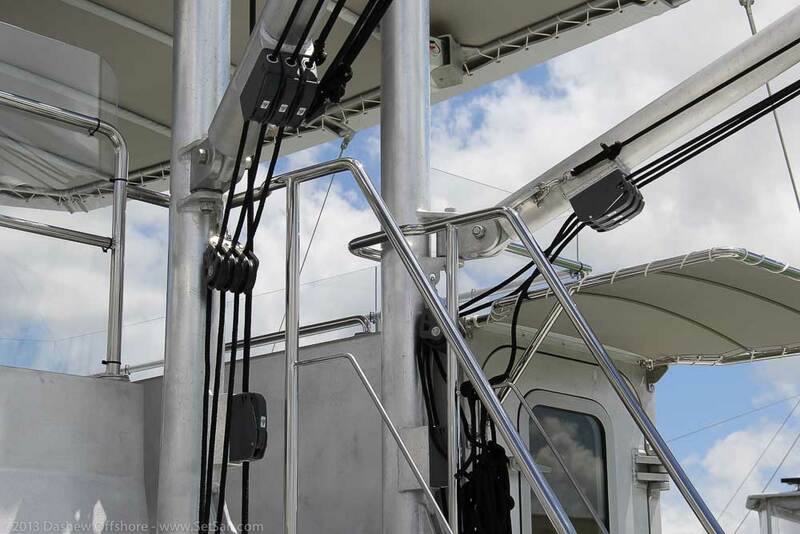 We will close with this photo of boom control and halyard rigging. For more information on the FPB series, contact Sue Grant: Sue.Grant@Berthon.Co.UK. This entry was posted on Sunday, December 8th, 2013 at 3:17 pm and is filed under FPB 64, FPB 64 Updates, FPB Series Notes, three, Wicked FPB 97. Both comments and pings are currently closed. Great photos as usual. Whose solar panels did you end up using and what spec please? We are fitting the highest efficiency SunPower solar panels (prox 21.5%). Rated Current: 3.28A Open Circuit Voltage: 48.2V) with an Ultrafast Victron MPPT for my small sailing yacht as I only have room for this 1 x 140 Watt panel on board. Still it will help a lot with my electric propulsion on day sails. I only use 750 Watts at 4 Knots and around 20 Watts for all NMEA Instruments. Re-assuring to know you use Sun Power. Beautiful. The scale of the 97 is stunning. You must do a video walk through next time you are down there. It’s a comfortable pod designed to protect you from virtually anything mother nature can dish out while taking you around the world. Beautiful work as ever. The door on the 64-8 with the full-length glazing and insulation looks real nice. Is that fabricated in-house or is bought from an outside source? 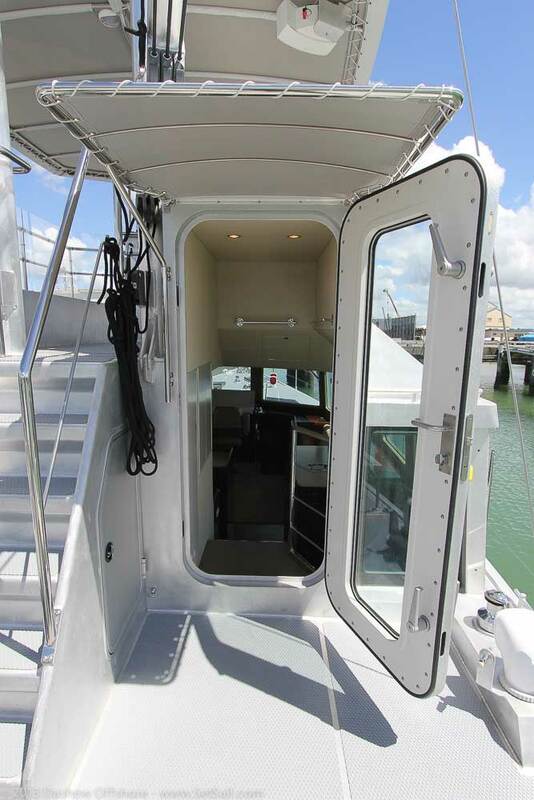 The entry door on the FPB 64 is a Circa fabrication. thanks for the detailed information on your website. Nice job, the way of thinking and producing these fine ships, great craftsmanship ! Only,the principle of keeping it simple is left behind. Lots of systems and electronics on board. Looks like an airplane ( familiar ?). Don’t you worry about failure ( it will: salt water, moisture etc.)? Too complex to fix it yourself, almost need an engineer to set sail. And what about costs. Electronics need te be replaced in 5-10 years. There is a trade off between function, comfort, and reliability with which we wrestle constantly.And we try and avoid systems which do not directly contribute to the goal of safe, comfortable, and enjoyable cruising. Over the years we have been reasonably successful in minimizing maintenance, and having sufficient critical system redundancy, so as to be able to continue along our way in the event of problems. The autopilots are a good example. There are two, totally redundant systems. 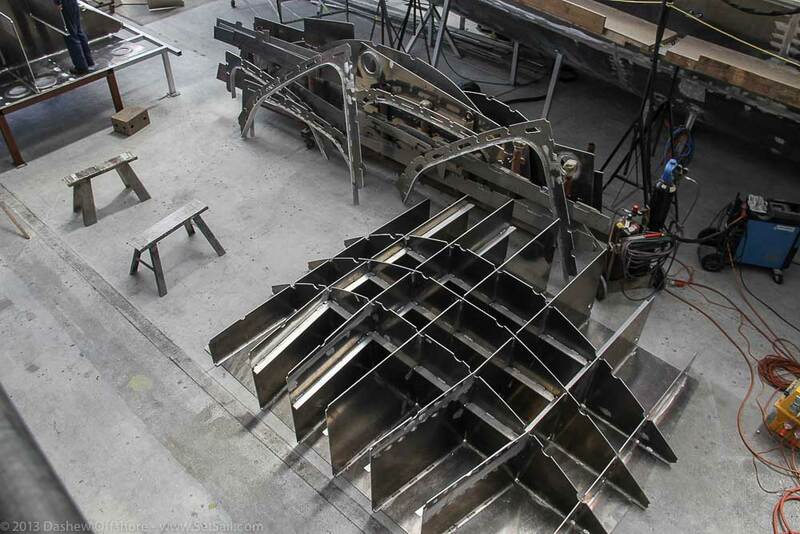 Another key is proper installation, in a dry environment – something that comes with a metal boat, if it is correctly built. There are always going to be infant mortality and/or debugging issues. Which is why we have extensive dock trials, and then a minimum of 50 hours of sea trials before the owner takes possession. There are still going to maintenance issues. But for the most part, these are easily dealt with. Is the forefoot at the bow of the FPB97 relatively deeper than other models? The forefoot of the 97 is different, but in scale, not deeper. 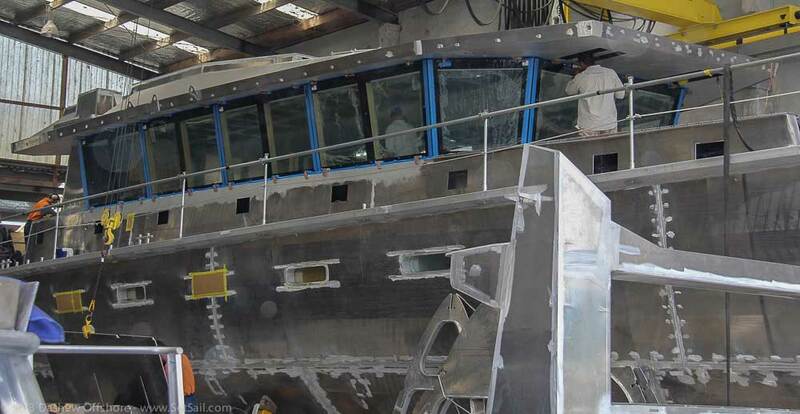 Is that fairing compound on the 97 hull? Wondering if the owner opted for paint? No paint or fairing compound! It is a ground finish test on the bare aluminum.